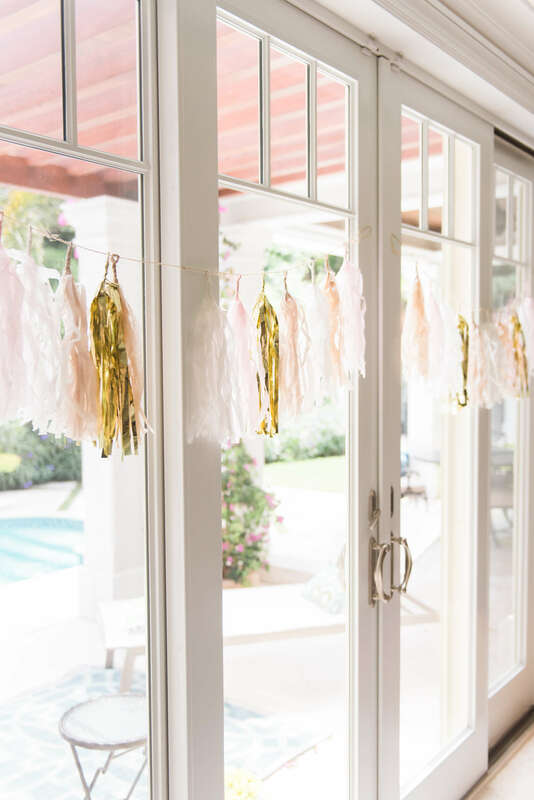 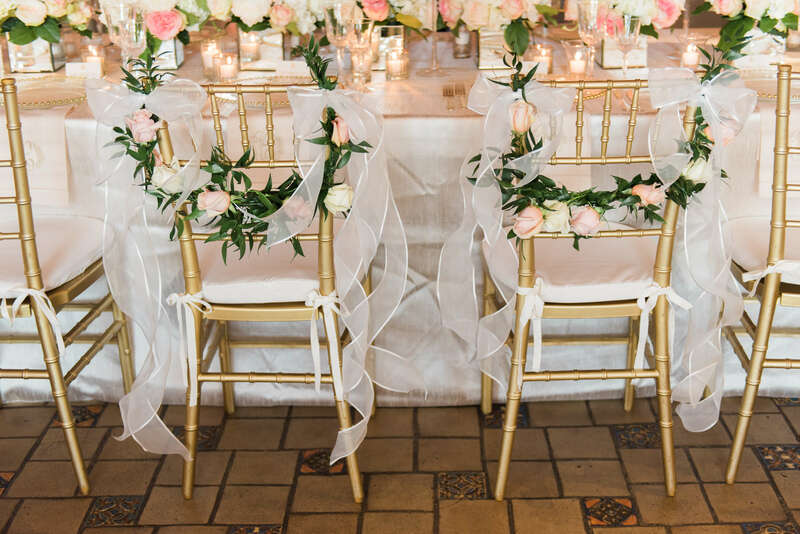 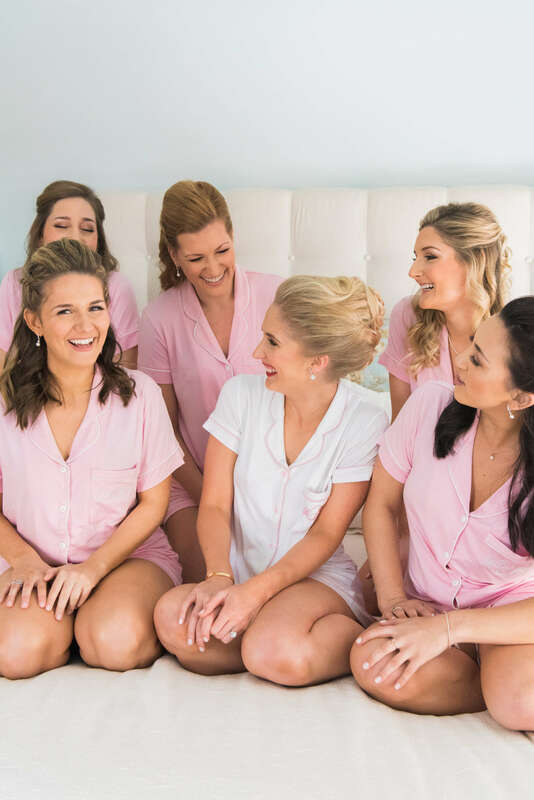 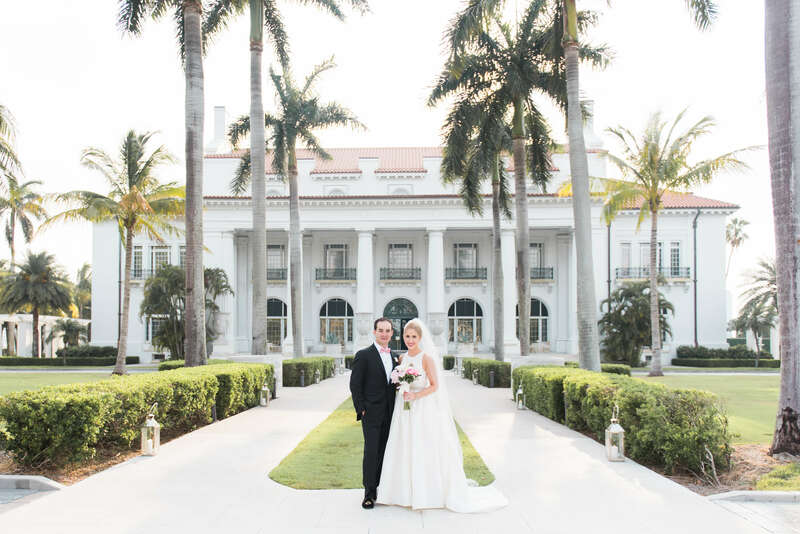 Stephanie and Matt’s elegant Palm Beach wedding was a mix of blush, mint, and gold, in one of the most beautiful settings you can imagine. 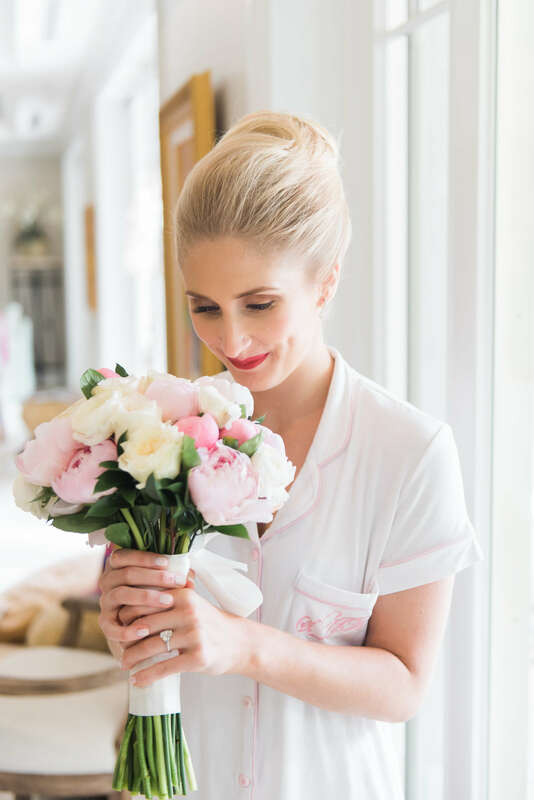 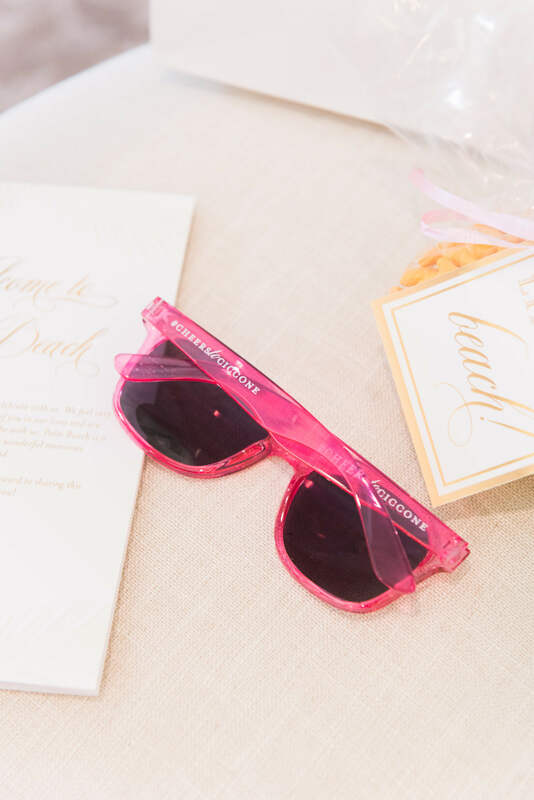 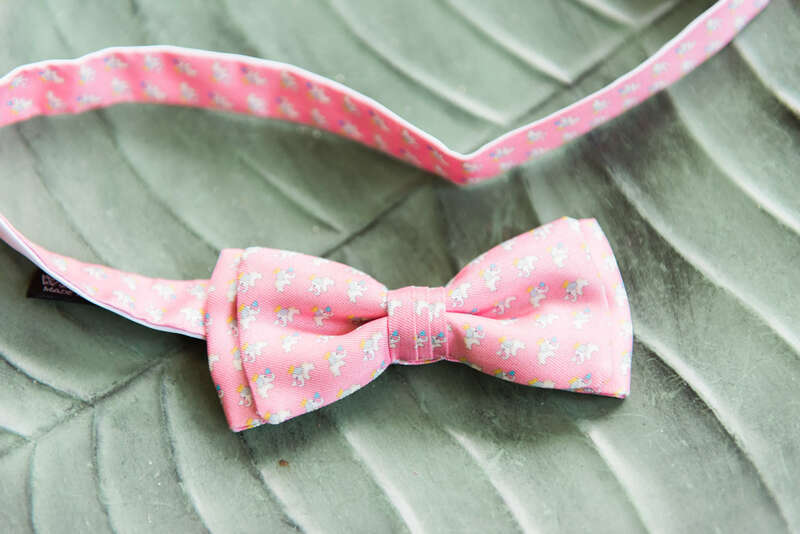 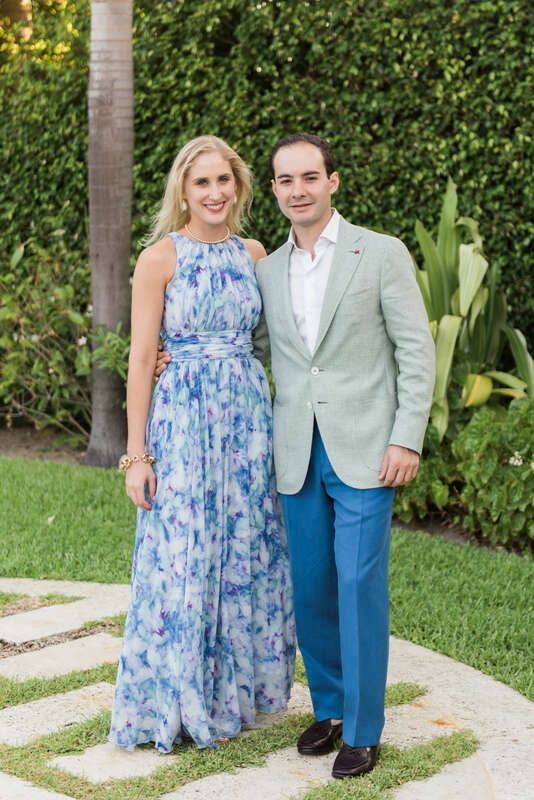 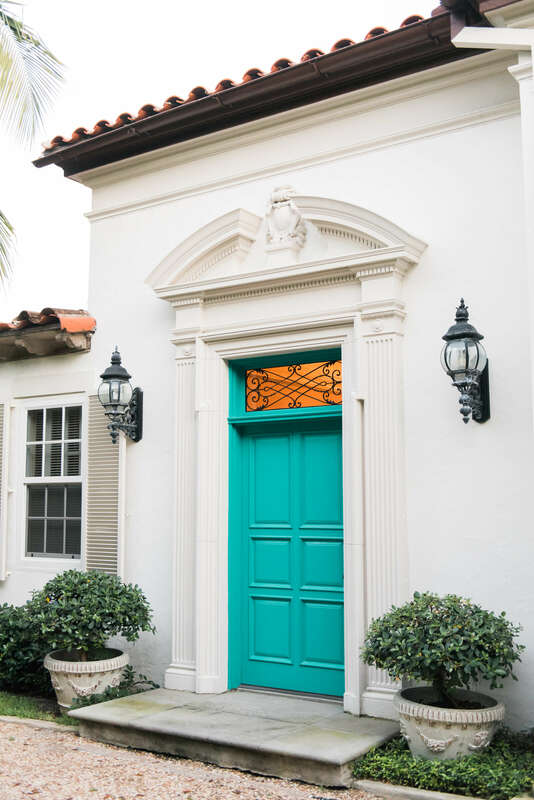 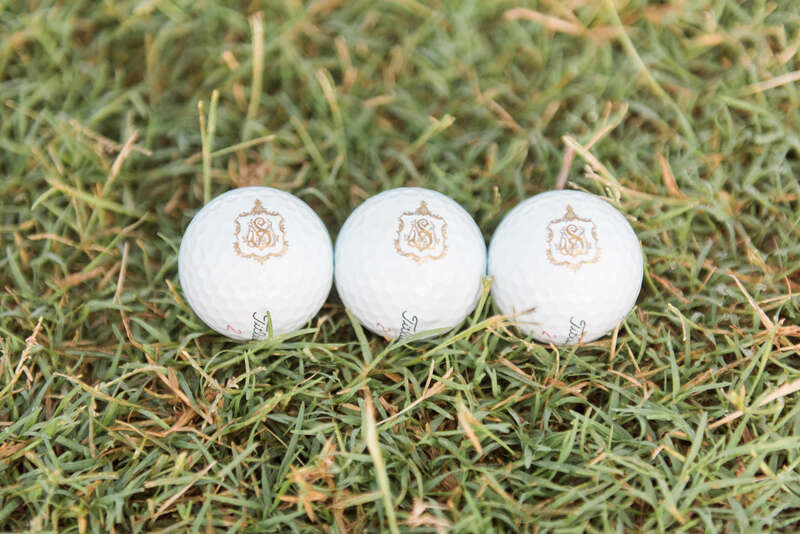 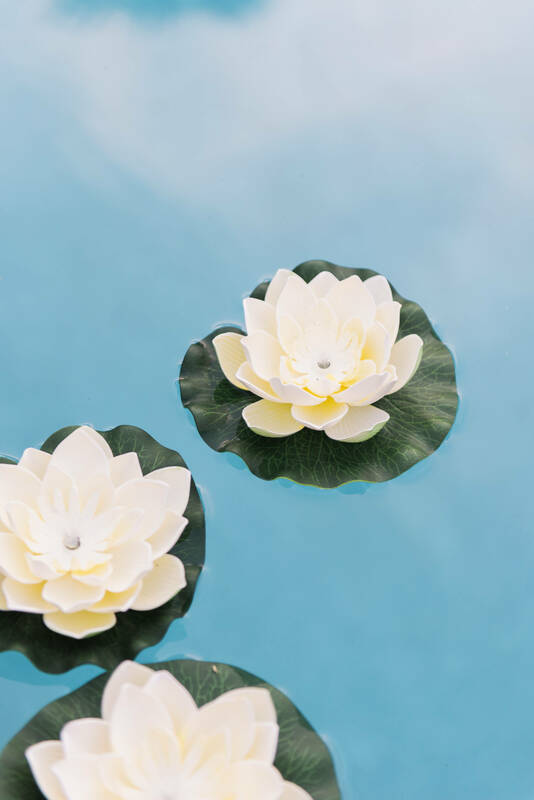 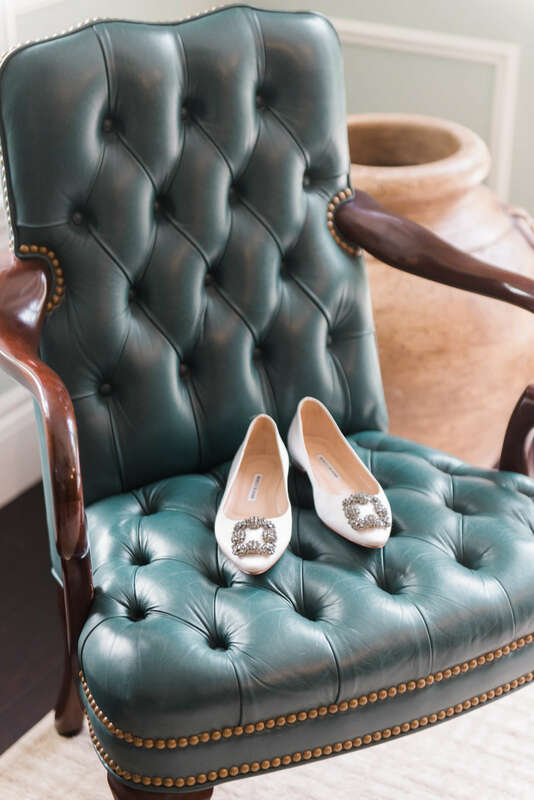 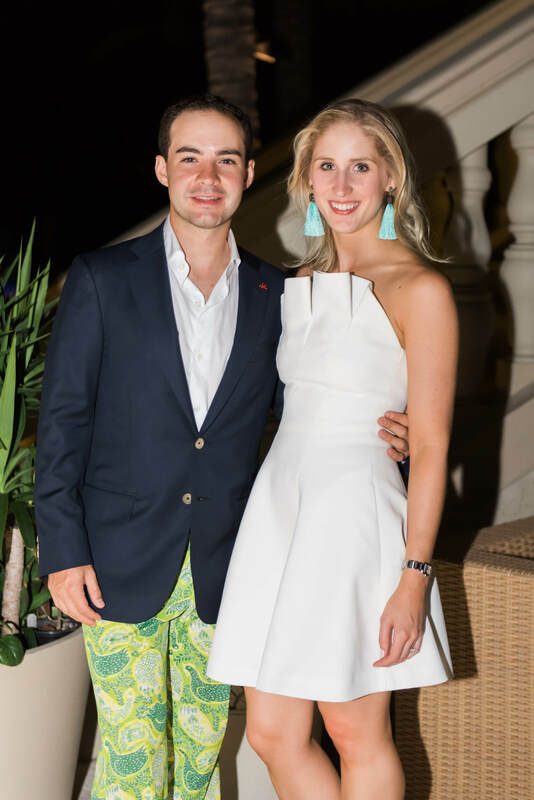 Palm Beach has a nostalgia about it, and as the birthplace of the Lilly Pulitzer brand and her colorful patterns, they wanted to embrace that vintage era. 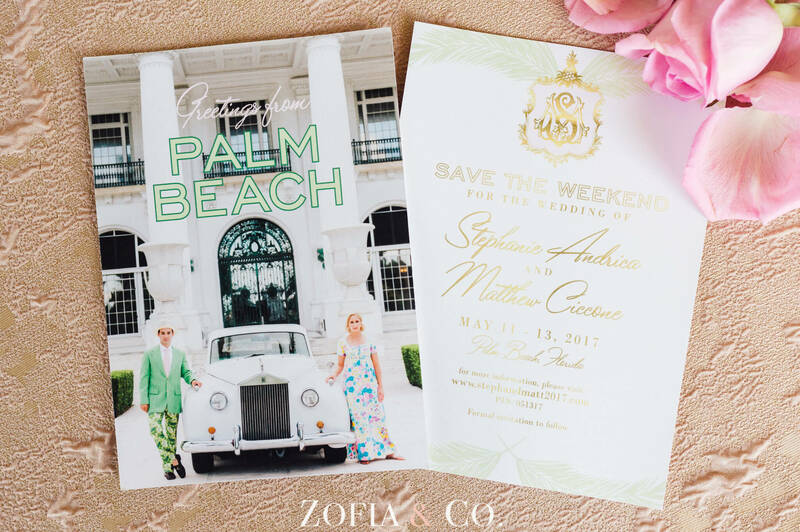 What better way than with a vintage car, clothing, and photoshoot for your Save The Date? 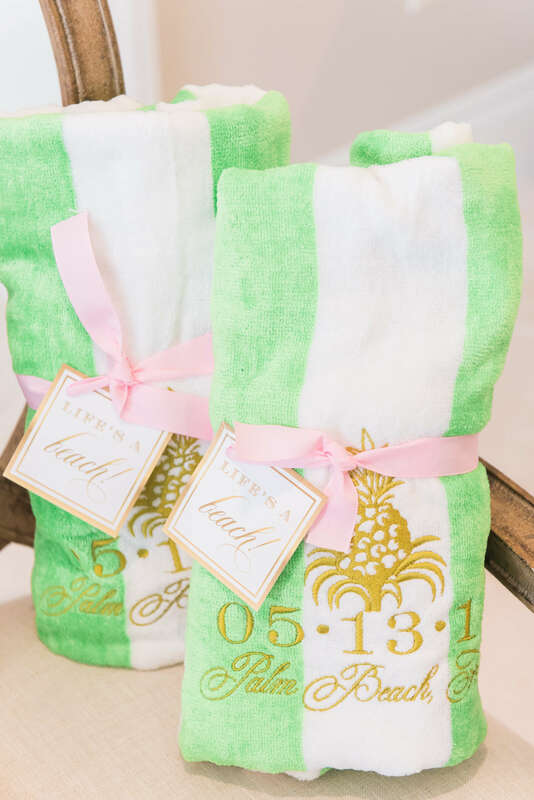 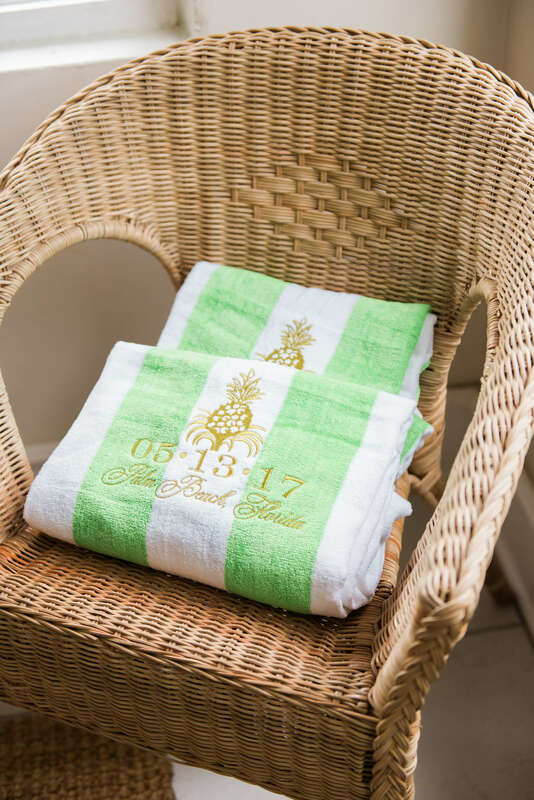 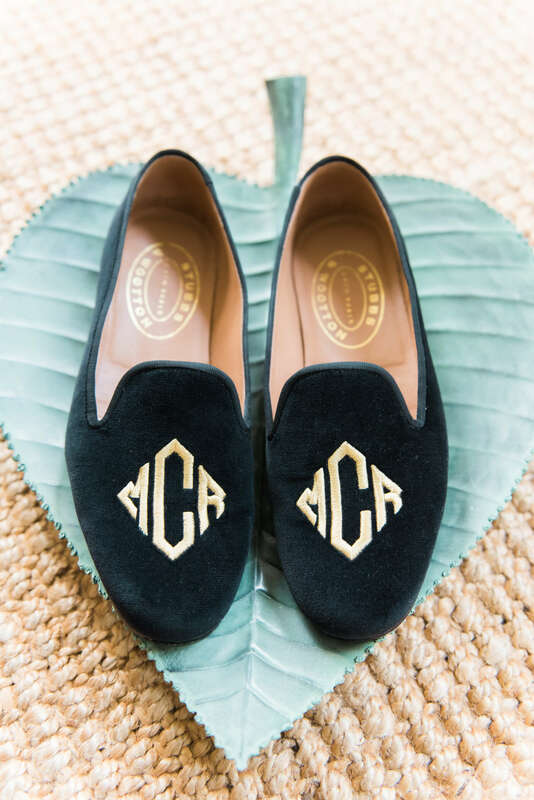 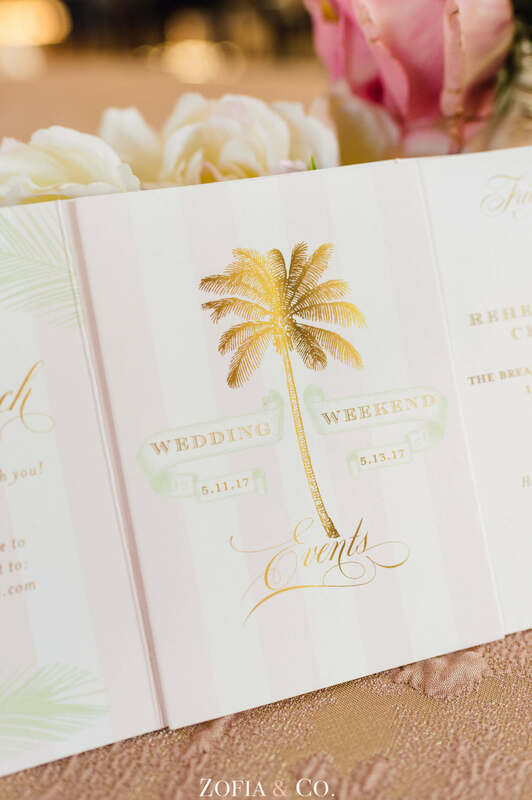 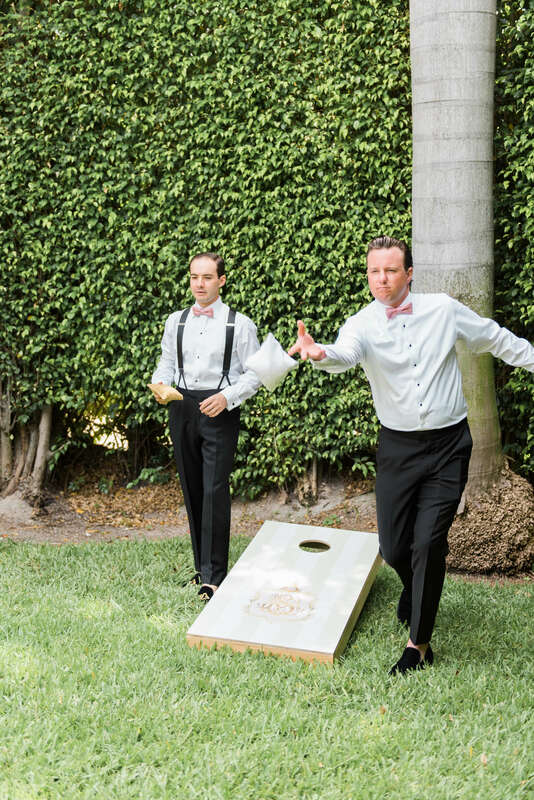 We are SO obsessed with these vintage postcard style Save The Dates, and the photos gave us inspiration to design a wedding logo of their initials, a pineapple, and palm fronds. 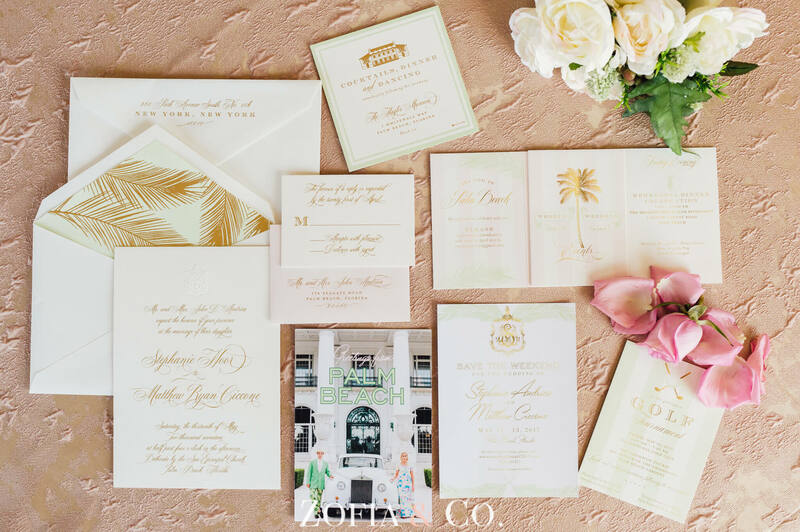 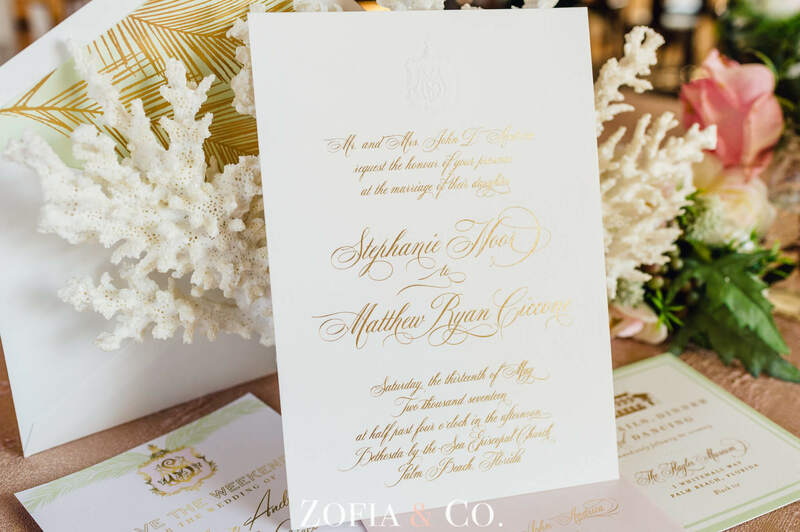 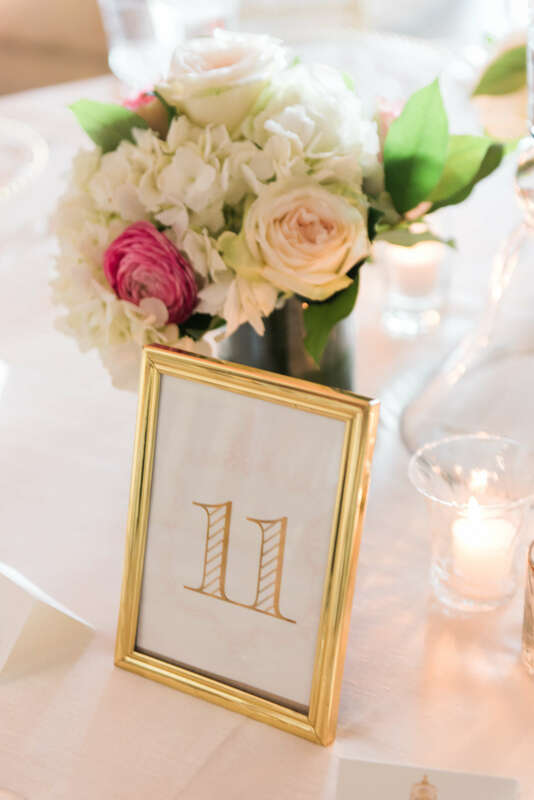 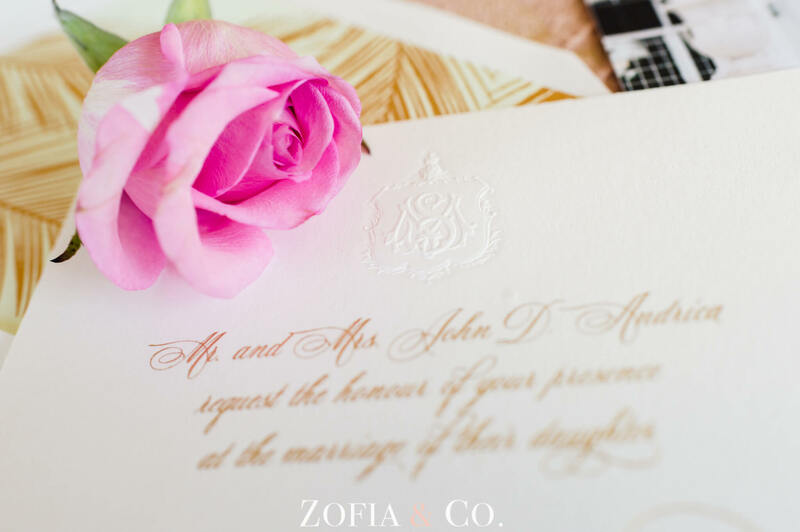 The wedding invitations expanded upon this vintage elegant Palm Beach style and were printed in gold foil with their wedding monogram subtly embossed at the top. 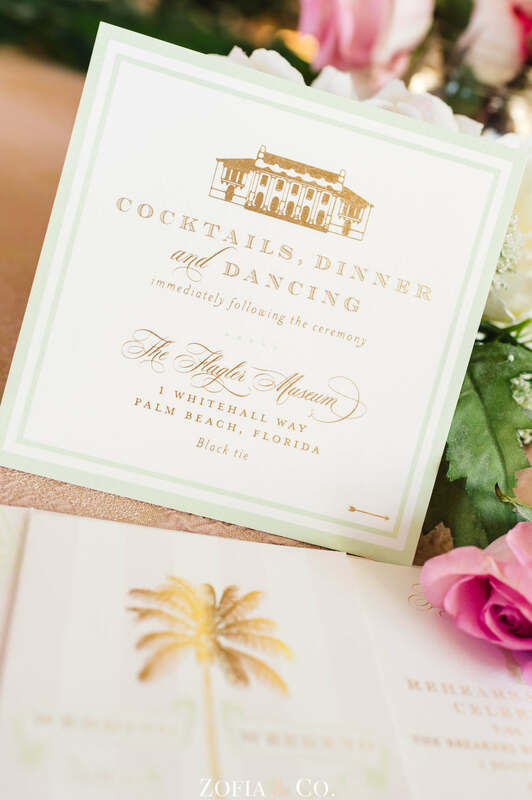 There were several insert cards including a wedding weekend itinerary, invitation for golf with the groom, and a reception card bearing an image of The Flagler Museum. 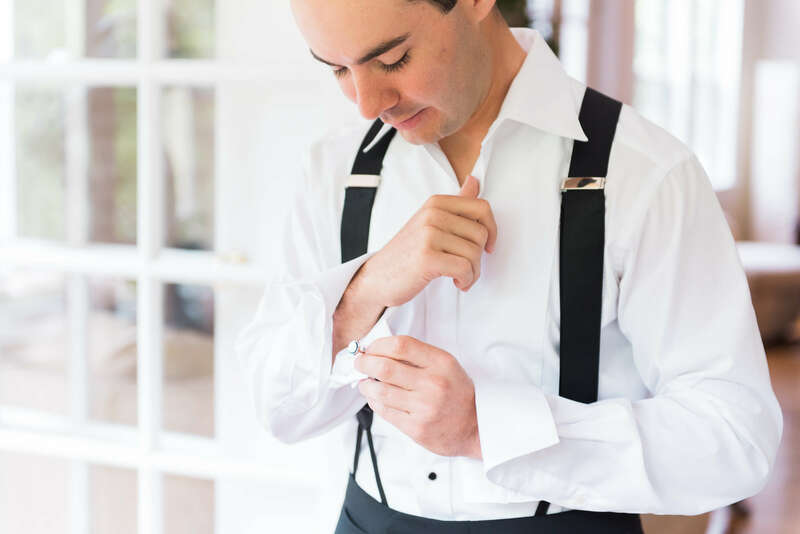 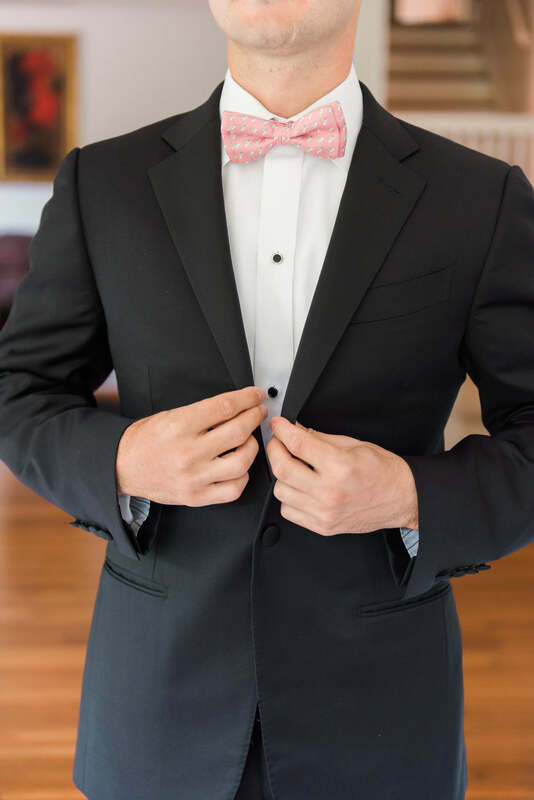 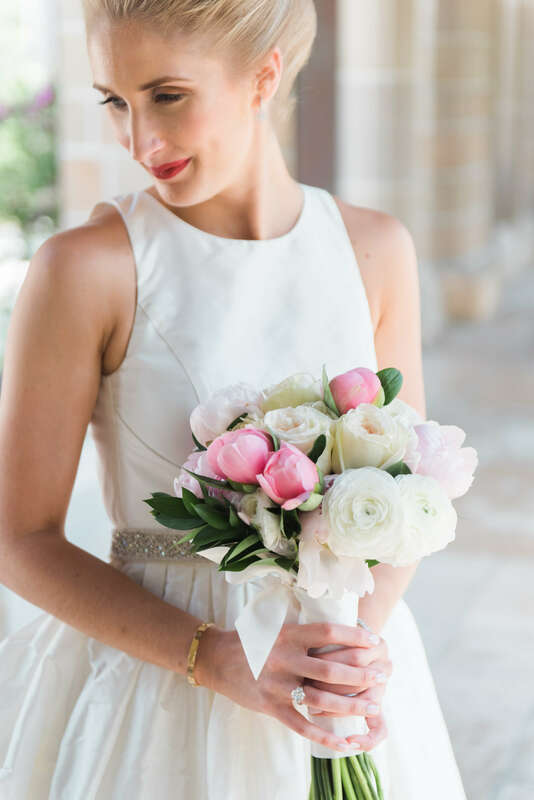 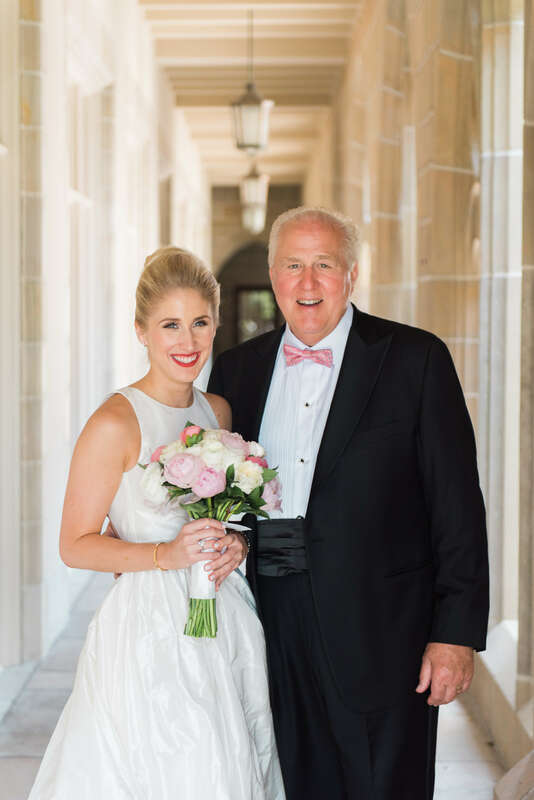 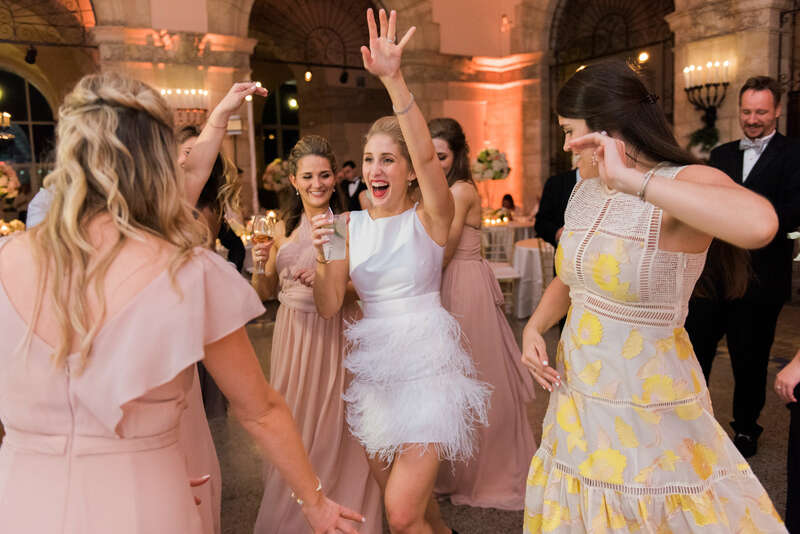 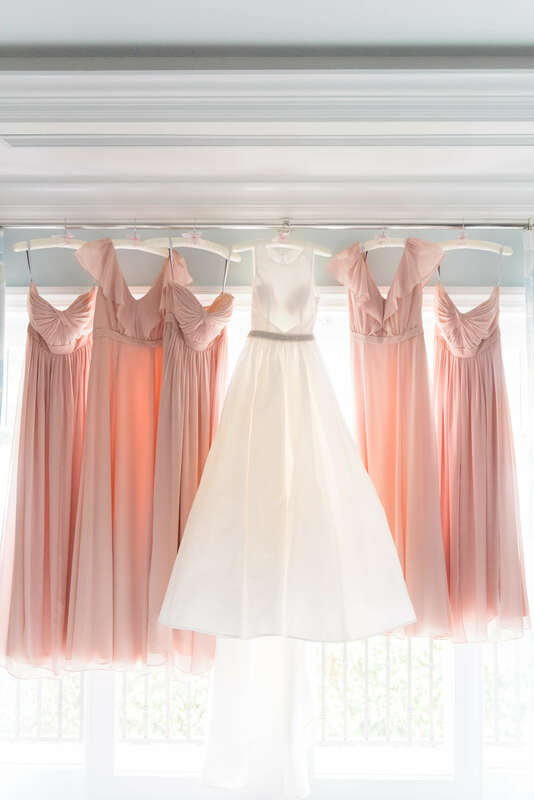 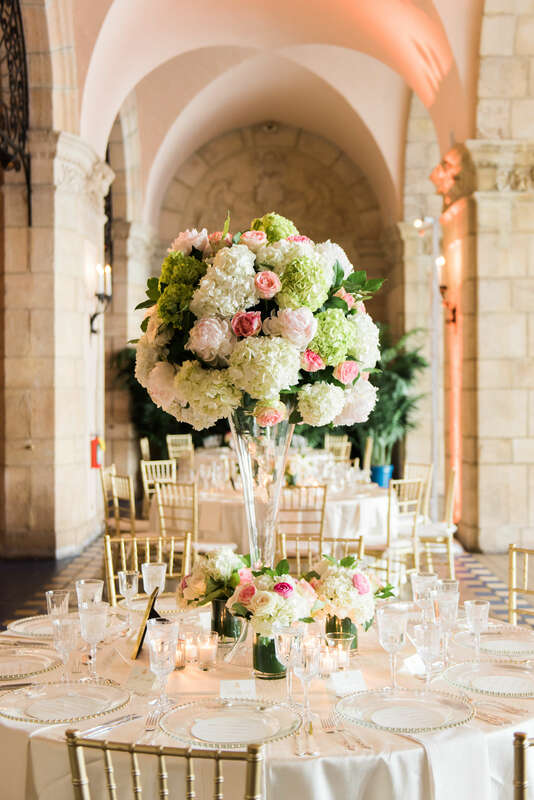 All of the insert pieces had blush and mint incorporated and the complete ensemble was perfection for this elegant Palm Beach wedding! 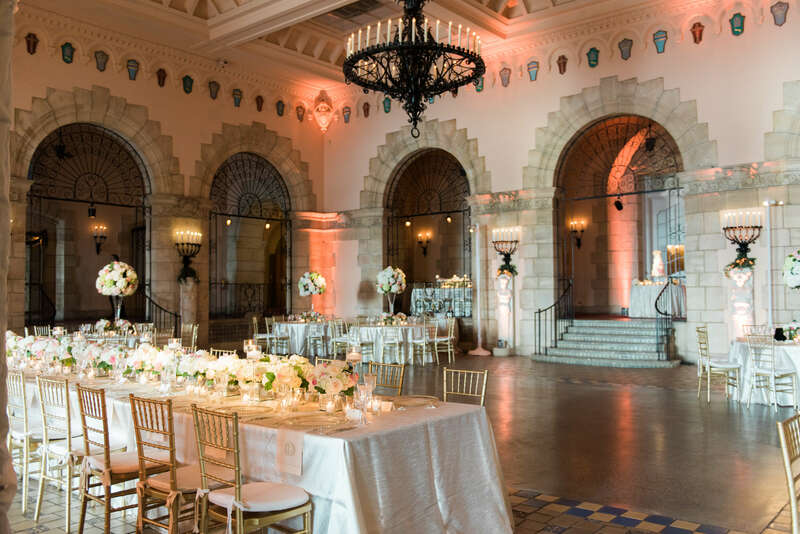 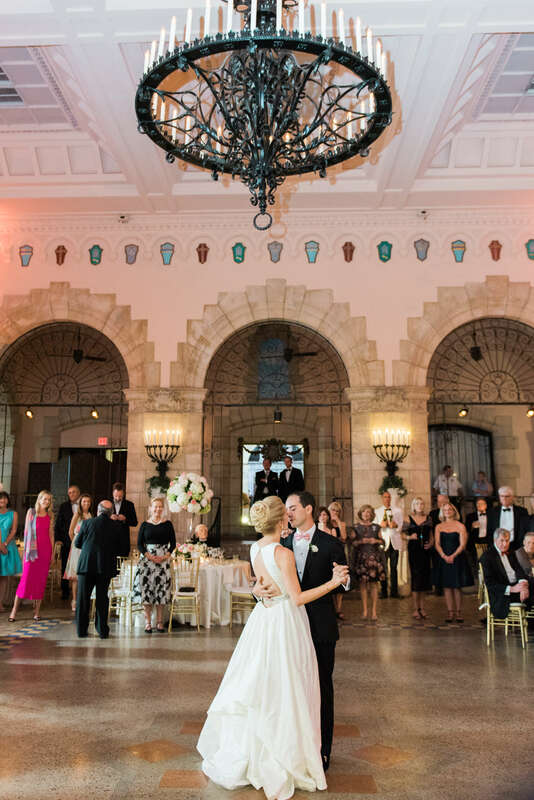 The reception was, again, held at The Flagler Museum and we love the European feel of the open air courtyard! 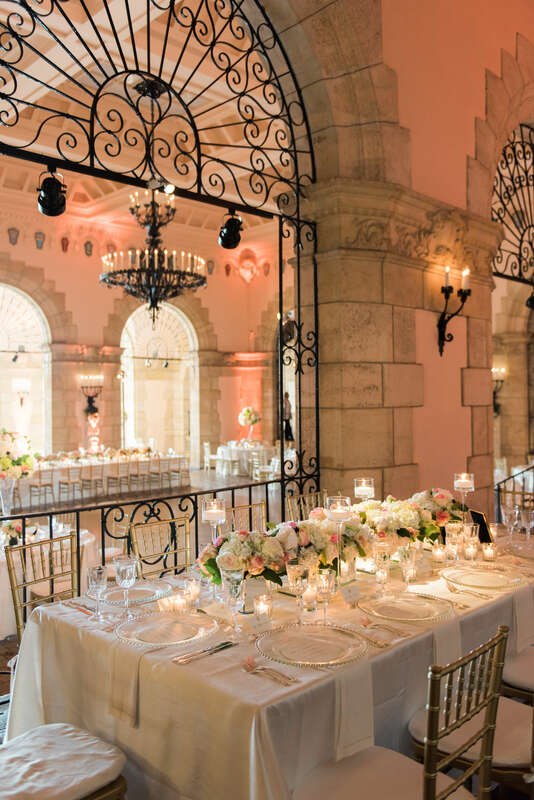 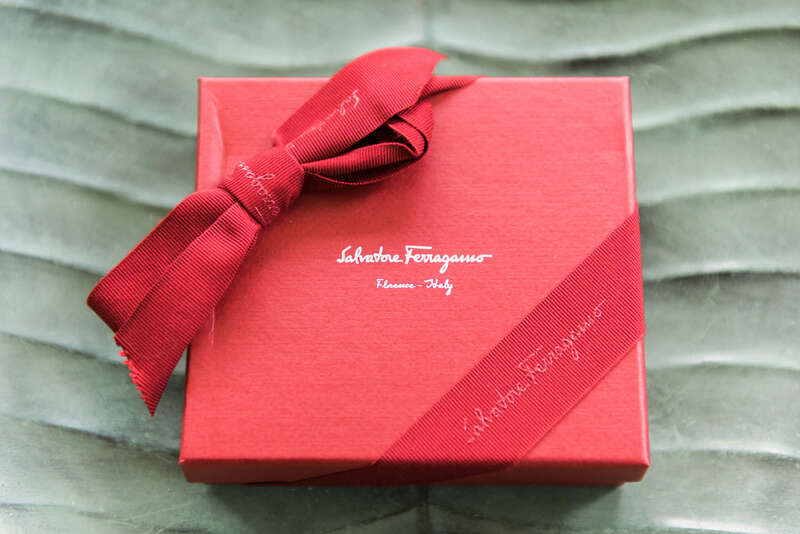 The wrought iron detail and stone building give it a timeless Italian vibe and grandiosity! 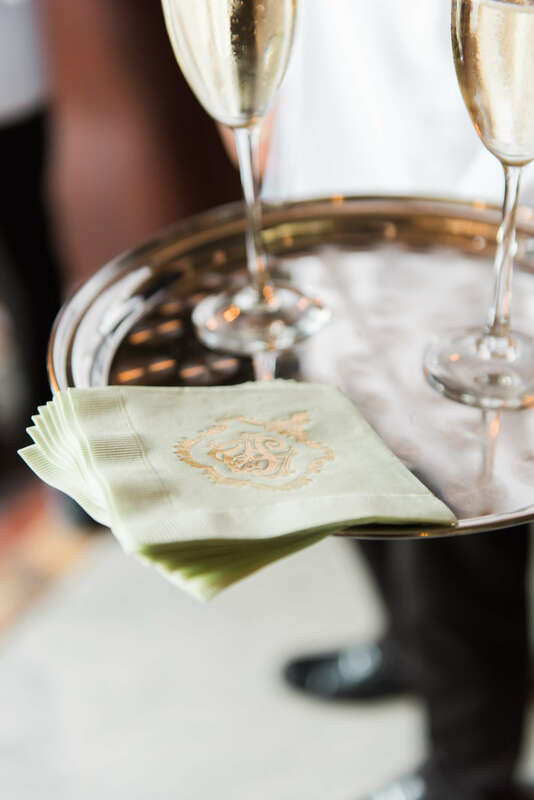 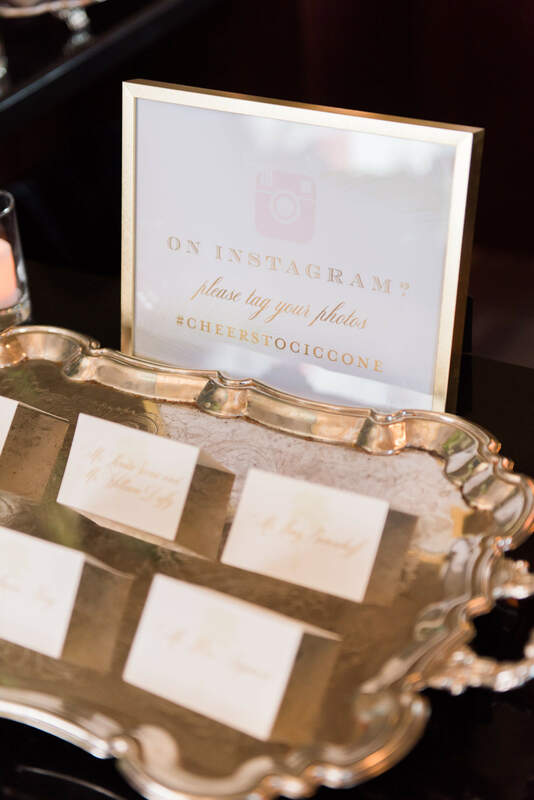 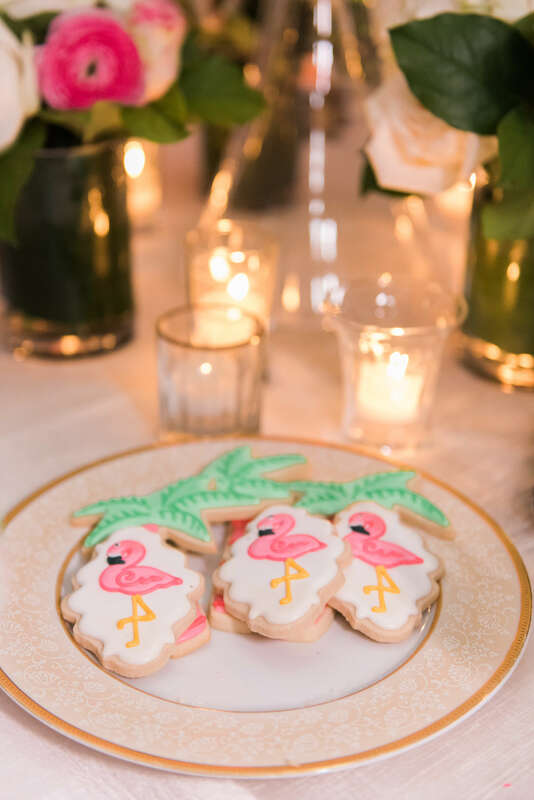 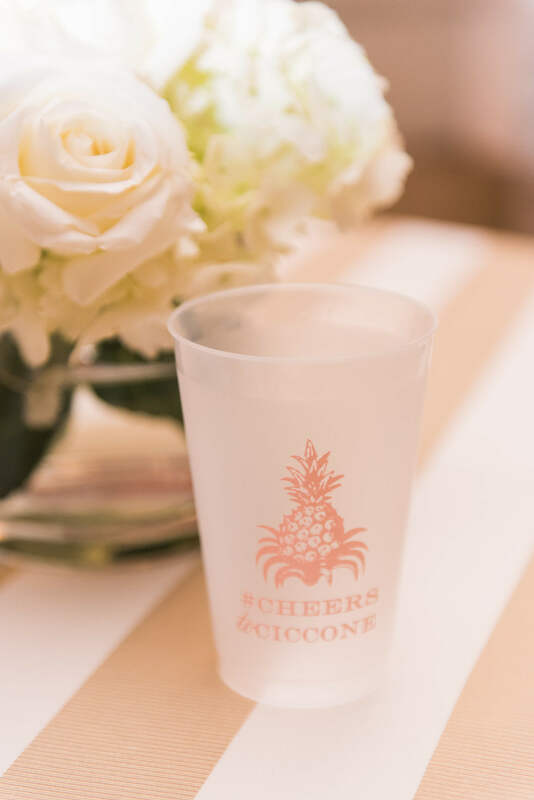 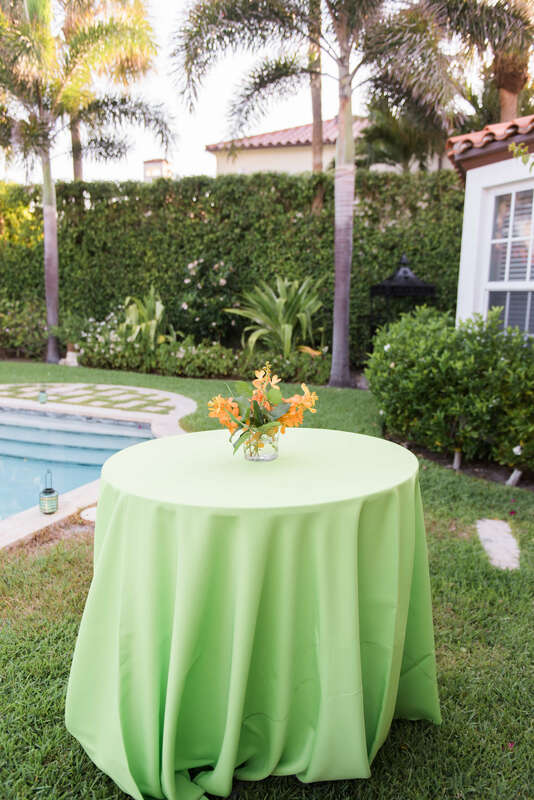 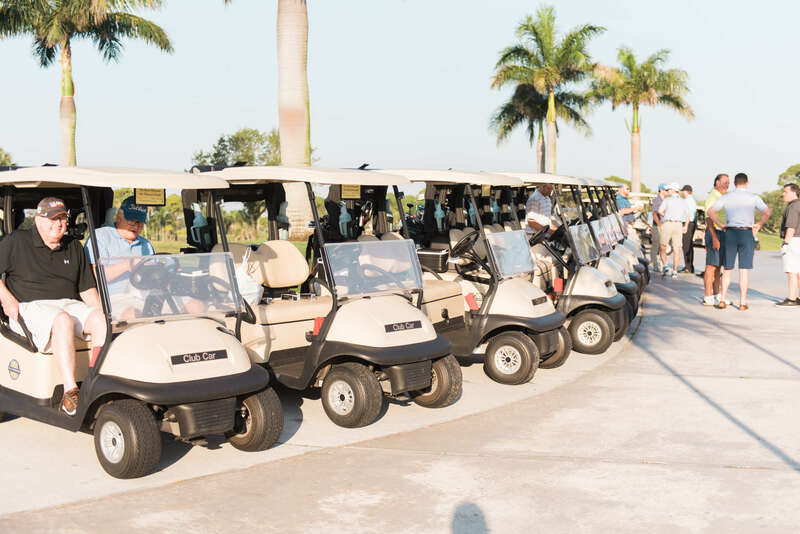 Each place setting was donned with a round menu card that was placed in the chargers and place cards were tented with palm frond accents. 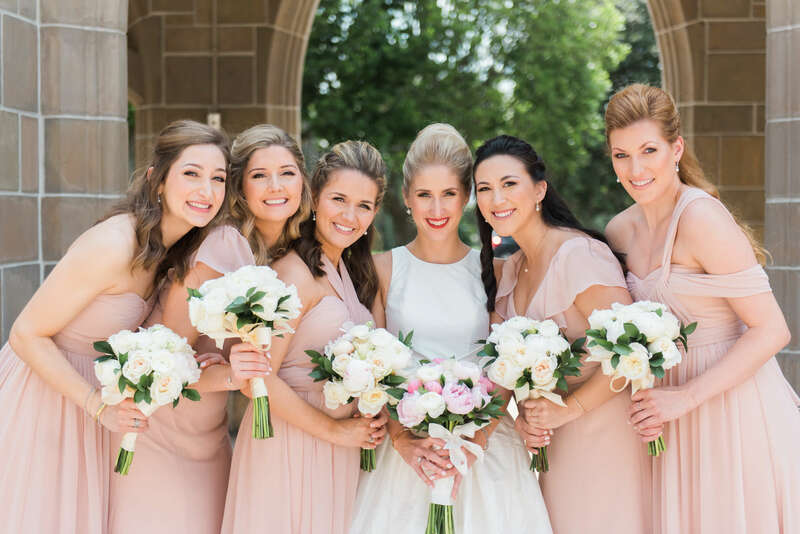 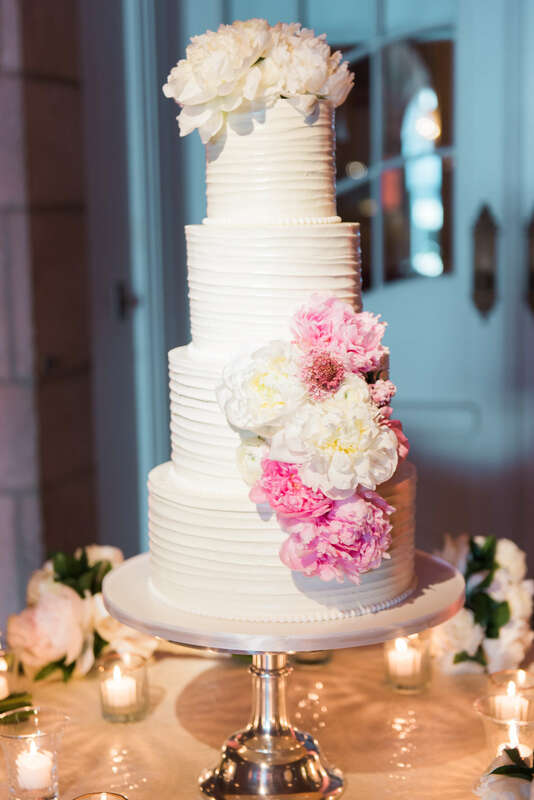 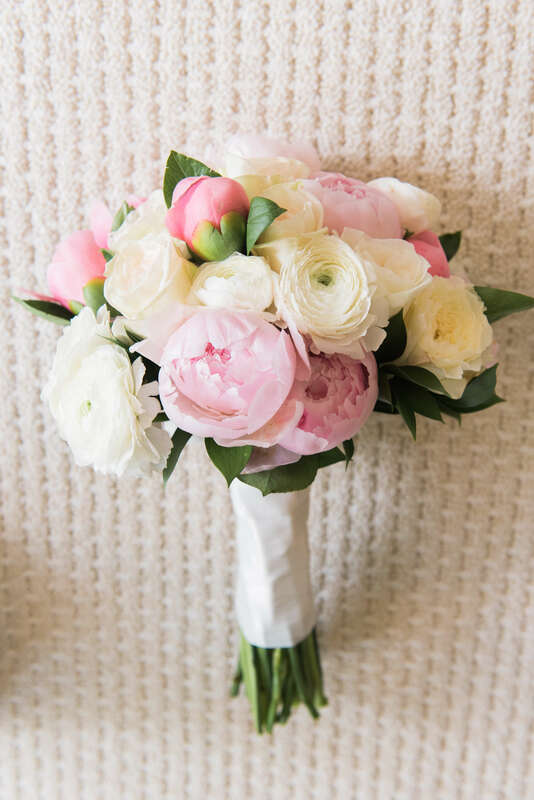 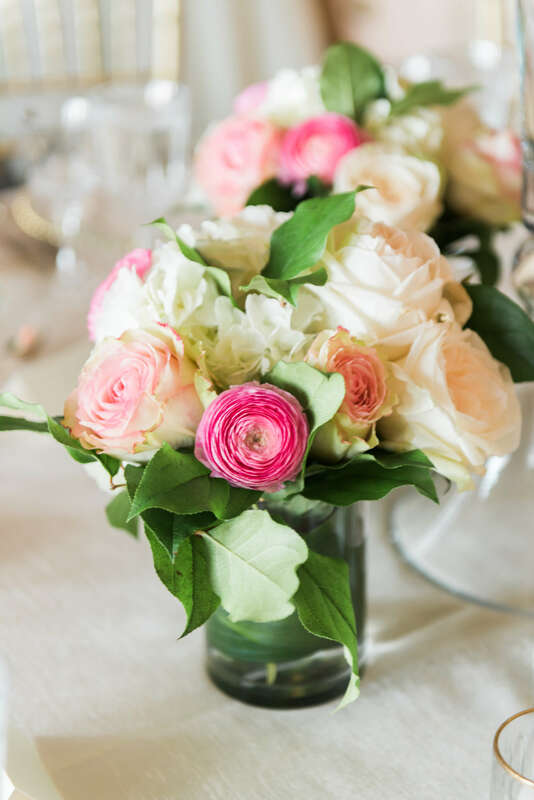 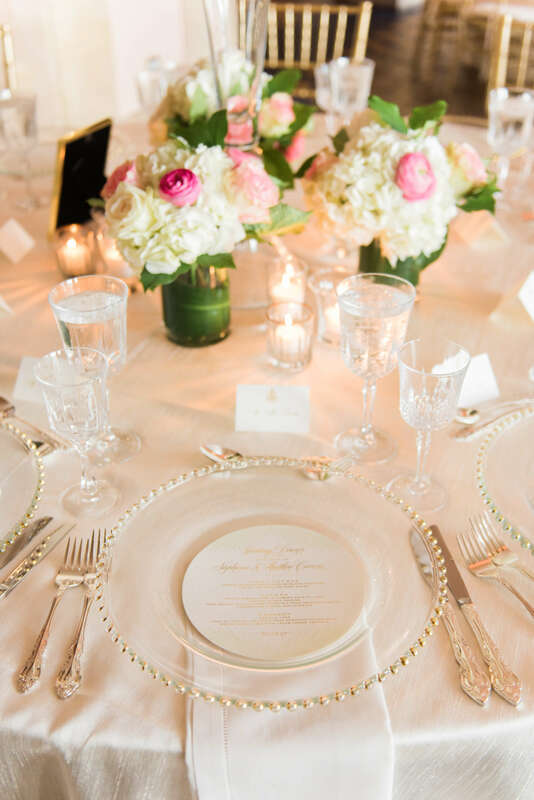 The arrangements were stunning and filled with white hydrangeas and blush and pink peonies. 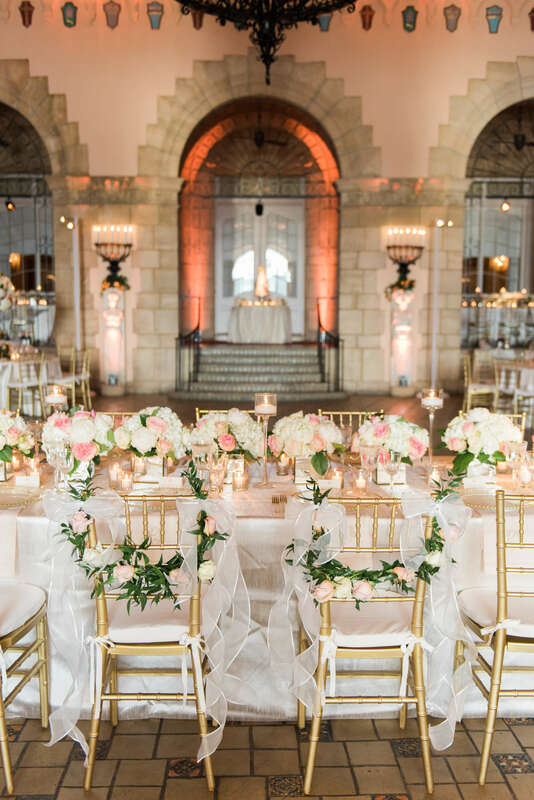 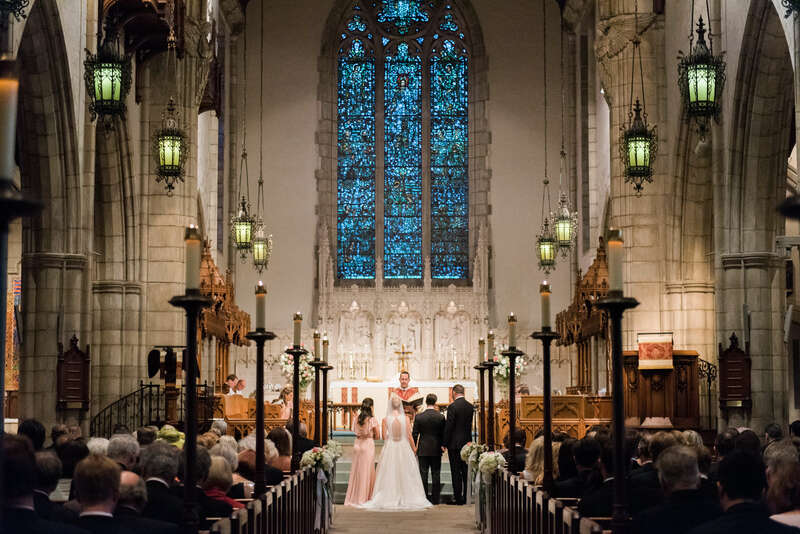 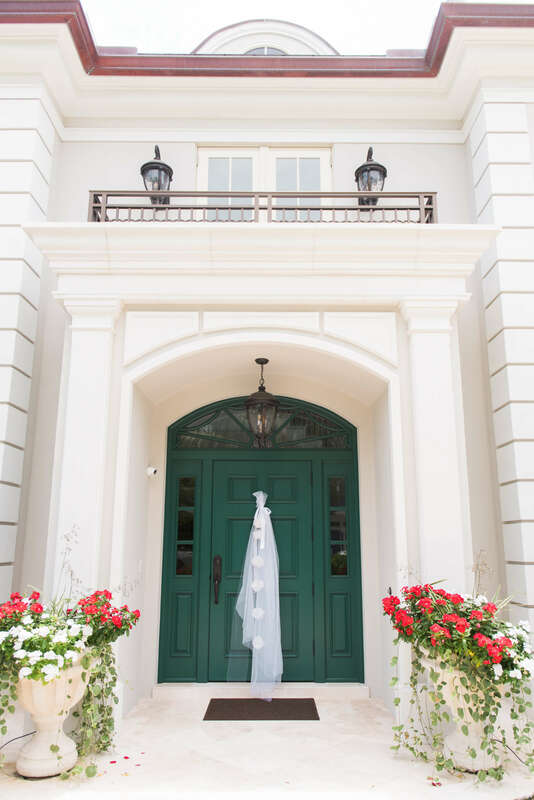 We also loved how unique it is that although the couple used blush and mint as their accent colors, the palette still maintained a neutral and not over bearing feel. 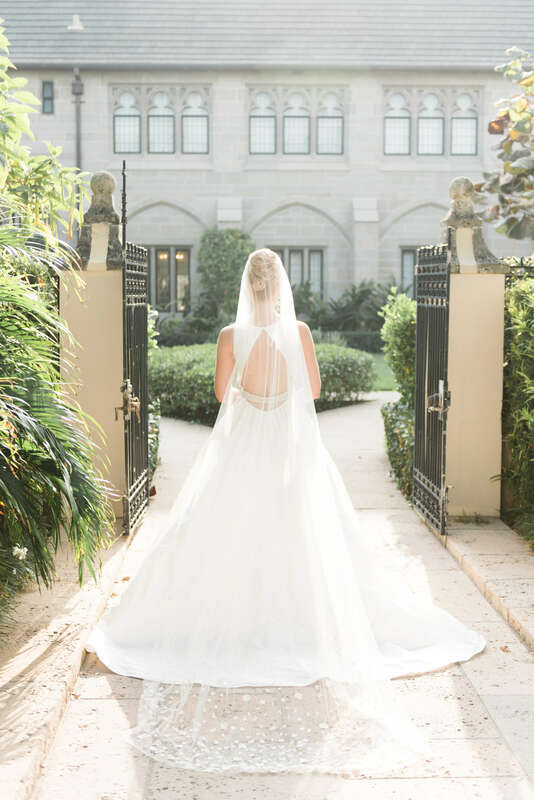 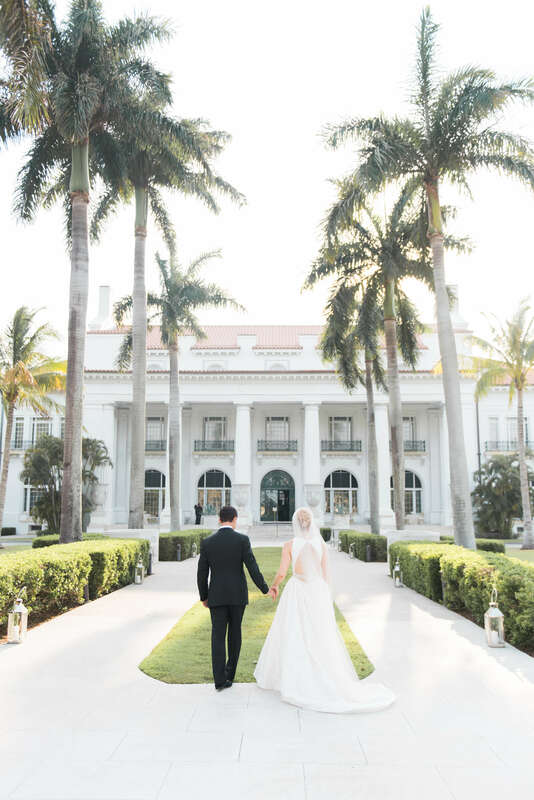 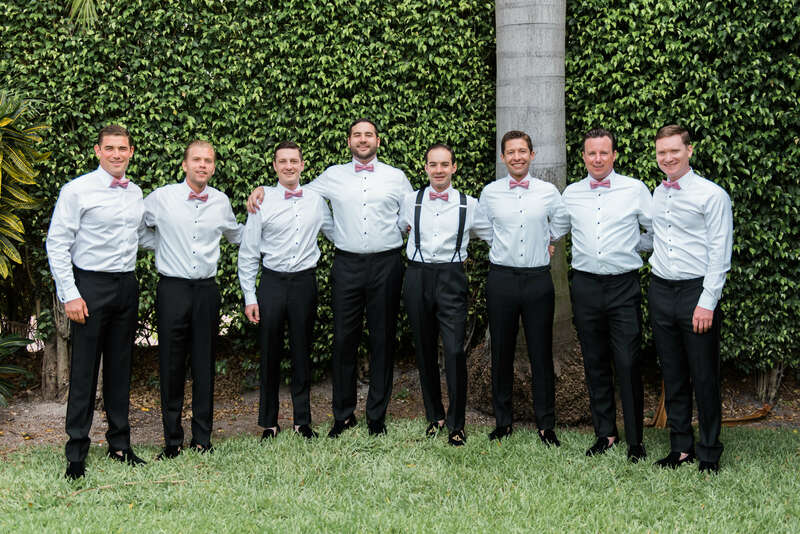 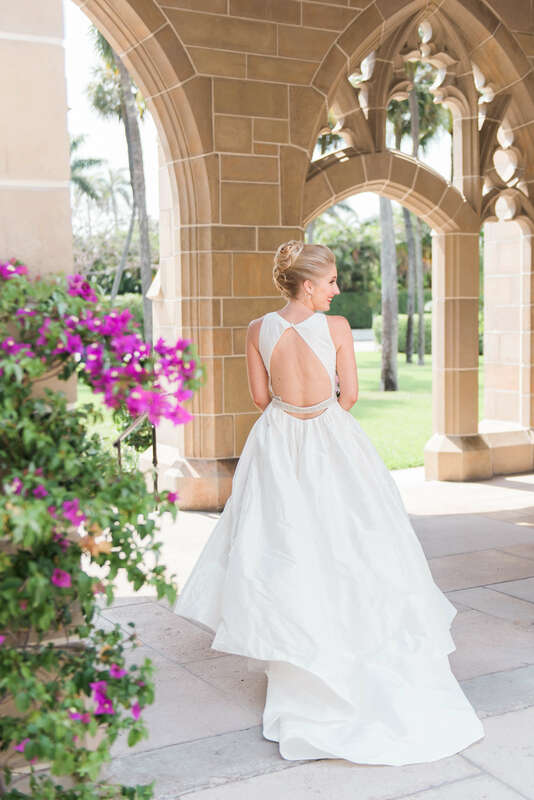 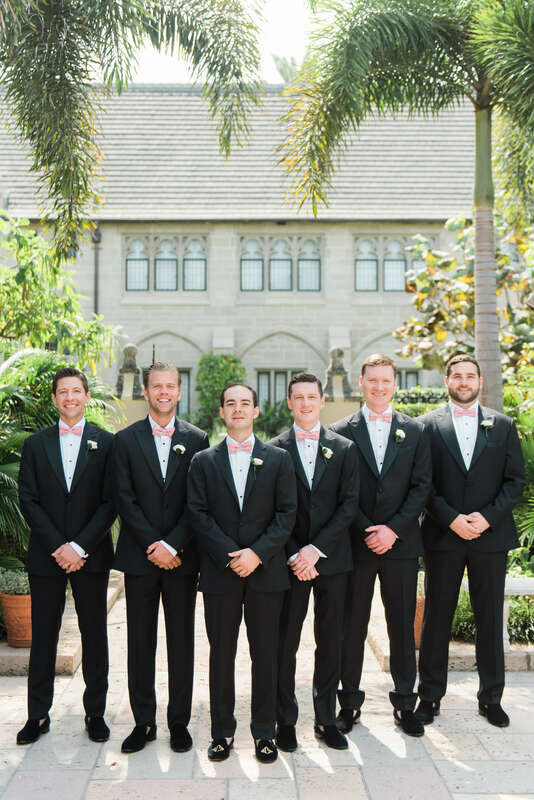 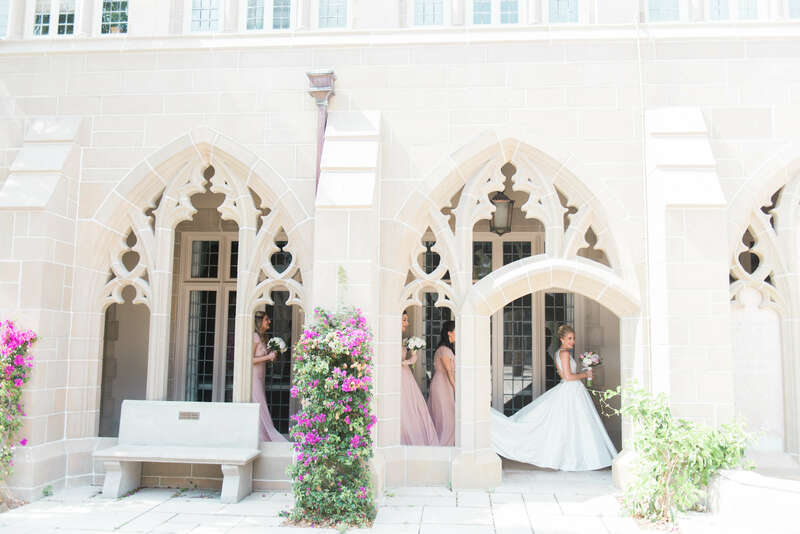 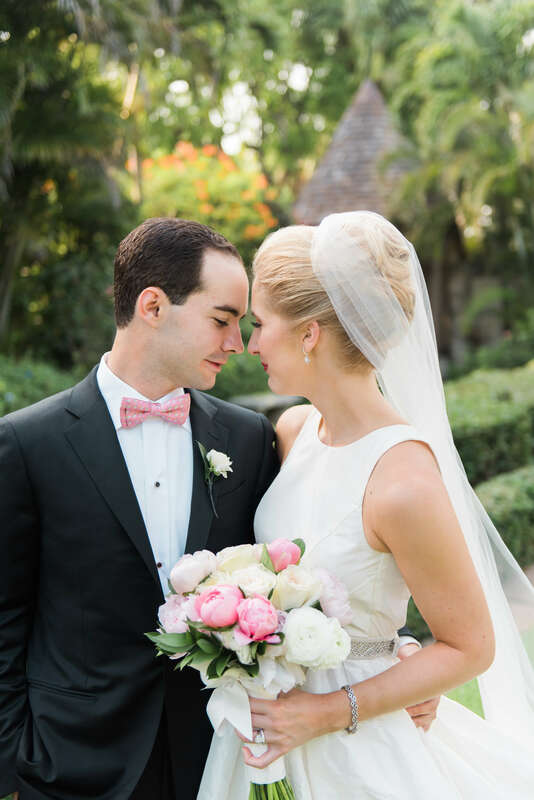 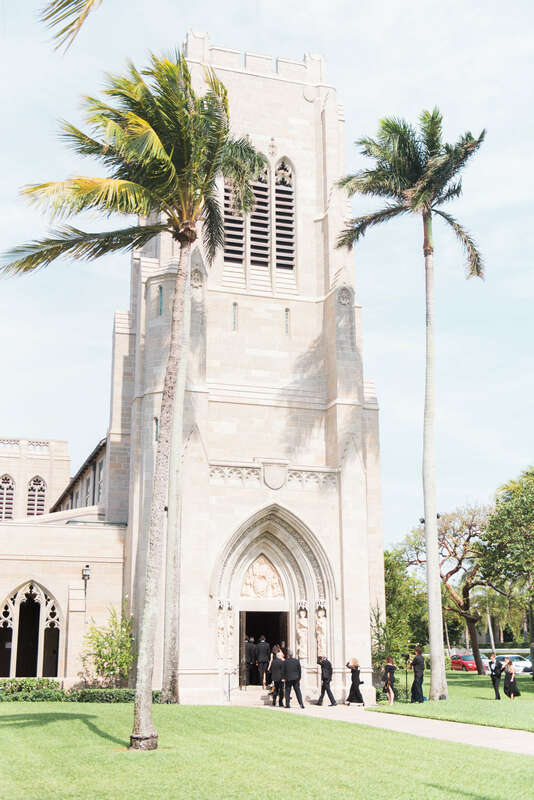 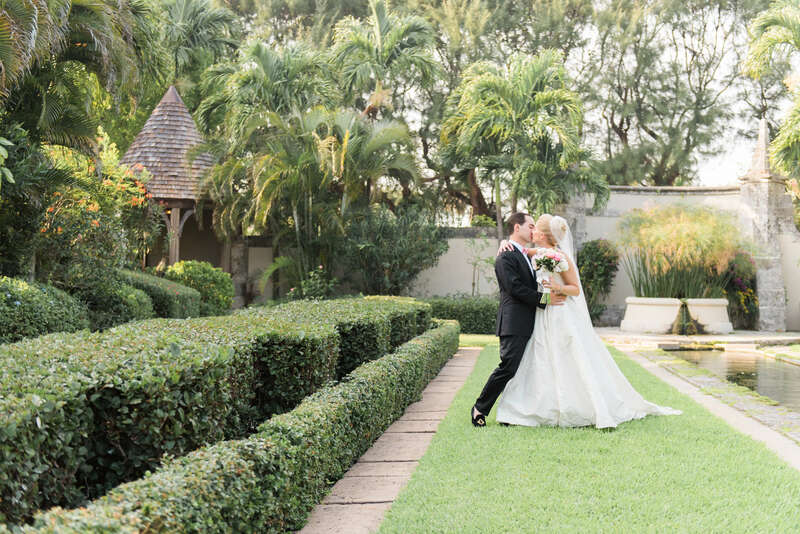 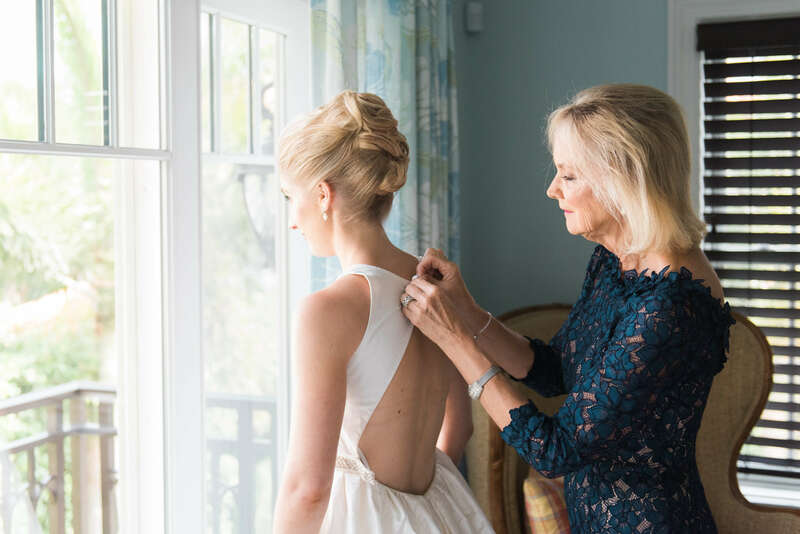 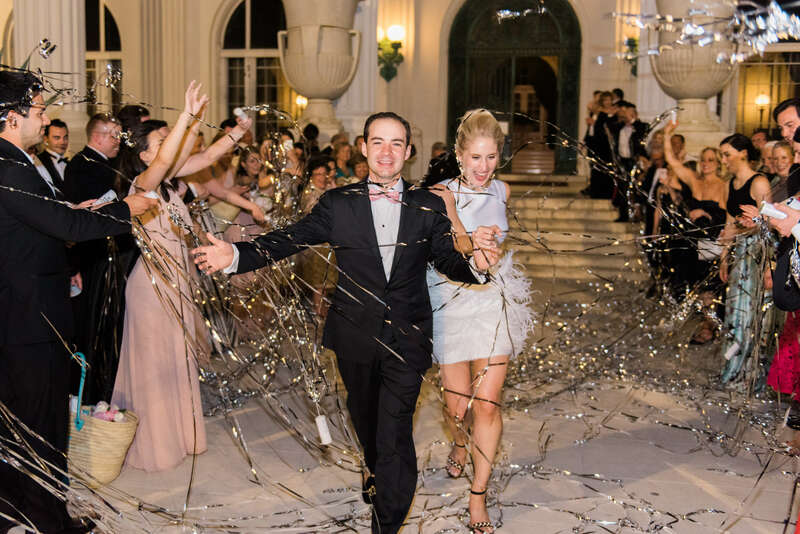 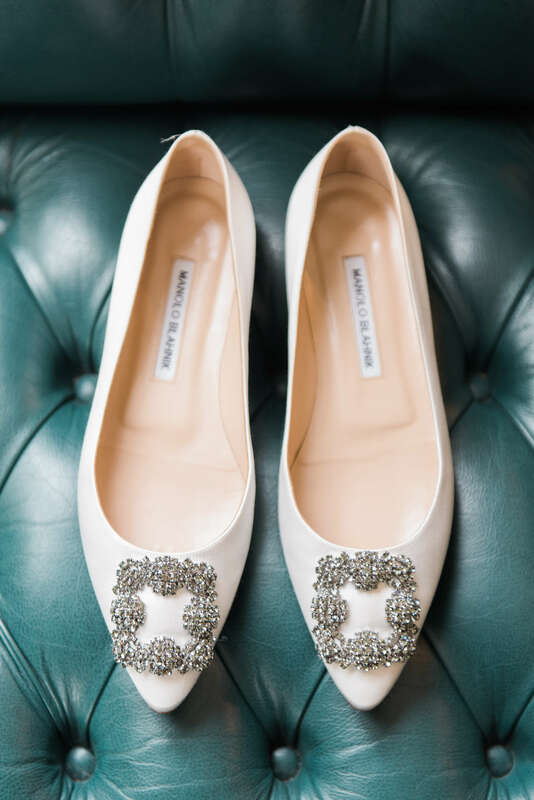 Cheers to Stephanie and Matt and this stunning and elegant Palm Beach wedding!